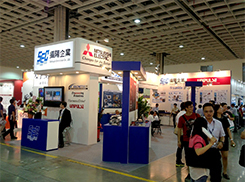 Touch Taiwan 2013 is a trade fair for touch panel, it’s manufacturing equipment and components. It was the second time held in Taiwan, the LCD industry leader in the world. There were around 400 participating companies - a higher number compared to last year. This event has become a venue for companies to share and develop next-generation technologies. Meanwhile, there were around 200 companies who attended the 25th year of the Taipei International Industrial Automation Exhibition. 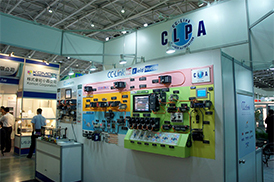 With the theme of automating manufacturing industries, automation-related products such as automation equipment, automation control systems, and automation control programs were featured in the exhibit. The aim is to continue expanding sales to manufacturing industries of flat panel displays (FPD) and touch panels, which are expected to have high demand from now on. On September 21, 2013, Mitsubishi Electric Corporation Factory Automation System Group presented 15 sets of Mitsubishi FX-PLC, 15 sets of Inverters, and 2 sets of AC Servo Systems to Myanmar Maritime University as a teaching tool for professional education. A presentation ceremony was held on a grand scale with 70 attendees in total, included Myanmar Deputy Minister of Transport Mr.Han Sein,7 ministry officials, 13 university officials and students, Peace Myanmar Electric (local agent of Mitsubishi Electric), news media (TV and magazines), and 2 representatives from Setsuyo Astec Corporation. Myanmar Maritime University is located in Yangon, the former capital and largest city in Myanmar. With around 2,000 students, this institution is known as the country's paramount technical university in the field of maritime education. The university is also known as the educational institute which fosters technicians who plays an active part in both the national and international waterway transport industry and supports further development of maritime studies by training competent technicians not just by mere theoretical knowledge but also through strengthening practical education. This is the first time FA Systems were donated to Myanmar educational institutions by Mitsubishi Electric. Mr.Khin Maung Myat, Executive Director of Peace Myanmar Electric Co., Ltd.